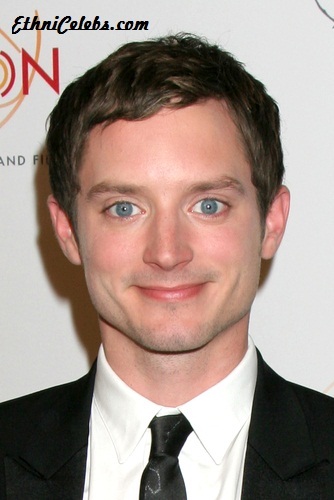 Place of Birth: Cedar Rapids, Iowa, U.S.
Elijah Wood is an American actor, film producer, and DJ. He is known for starring as Frodo Baggins in the Lord of the Rings series, and for his many other films. His sister, Hannah Wood, has also acted. His father is of half English-Irish and half German descent. His mother is of one half Danish, one quarter German, and one quarter Austrian, ancestry. Elijah’s paternal grandfather was Charles Fredric Wood (the son of William P. Wood and Elizabeth Jane Higo). Charles was born in Iowa, to English parents. William from Manchester, and was the son of James Wood and Elizabeth Tattersall Bramwell. Elijah’s great-grandmother Elizabeth was from Cumbria, and was of Irish or half Irish ancestry. She was the daughter of James Higo and Alice Bridget McCann. Elijah’s paternal grandmother was Eloise “Ellie” Lehrman (the daughter of Herman Lehrman and Anna Luedemann). Eloise was born in Iowa. Herman was born in Iowa, of German descent, the son of Louis Lehrman and Minnie Katharina Dorothea Wilhelmina Wendt. Anna was born in Iowa, the daughter of German parents, Joachim C. “Joe” Luedemann and Louisa C. “Lissie” Budde. Elijah’s maternal grandfather was Donald G. Krause (the son of Arthur J. Krause and Kathryn/Katherine Louise Hansen). Donald was born in Iowa. Arthur’s parents, Gustav Krause and Martha Magdaline Augusta Kramer, were German. Kathryn was the daughter of Andrew Johannes Hansen Knack/Knak and Thora Siegrid Johansen/Johnsen, who were Danish. Elijah’s maternal grandmother was Beverly Ann Stebritz (the daughter of Henry/Heinie William Stebritz and Rose H./E. Madsen). Beverly was born in Iowa. Henry was an Austrian immigrant, and was the son of Joseph Frank Stebritz and Barbara Ernestine Finster/Fenster. Rose’s parents, Christaffer/Chris/Christ Madsen and Johanna/Anna K. Hansen, were Danish. Are Austrians genetically different from Germans? More Slavic input, depending on the region, but very similar. Central Europe is a hodge-podge of peoples.